August 29, 1953, W. R. M. Mason. Sympistis wilsoni is a small (FW length 11 mm) day-flying moth with mottled grizzled gray to dark brown-gray forewings with white orbicular and reniform spots and a dark brown-gray hindwing with a white fringe that flies in the mountains of southeastern British Columbia and northern Washington during the summer. 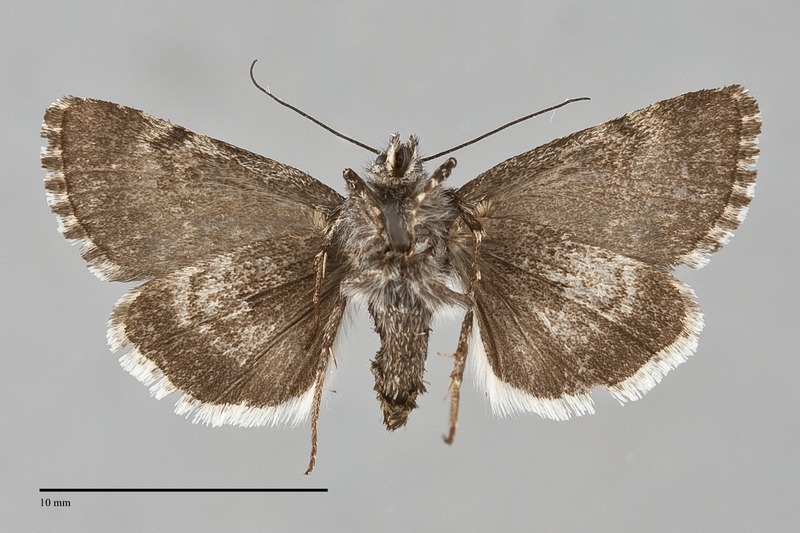 The forewing is variably dusted with light gray scales on a dark brown-gray ground. The color is nearly even across the wing. Black lines connect the reniform spot to the orbicular spot and postmedial line. The lines are black, with light whitish gray components of the antemedial and postmedial lines opposite the median area. The antemedial line is strongly zigzag, nearly perpendicular to the wing. The postmedial line is moderately scalloped, bluntly excurved around the reniform spot and slightly concave toward the base below the spot. The subterminal line is whitish gray, uneven with the tips of several teeth reaching the outer margin in many specimens. It is preceded by black shade or series of spots, often largest and darkest on the costa. The terminal line is a series of dark spots between veins. The fringe is weakly to moderately checkered light and dark gray. The orbicular and reniform spots are small, outlined in thin black and filled with whitish gray peripherally and dark gray centrally. The orbicular spot is oval and the reniform spot is kidney shaped. The claviform spot is thin, evident mostly due to light filling. The hindwing ground color is smoky dark gray, usually with a few paler scales on the mid-wing and more solid dark gray margin. The hindwing fringe is white with a thin yellow and gray base. The head and thorax are hoary dark gray with weak transverse banding on the collar, covered with long hair-like scales. The eyes are reduced in size. The male antenna is filiform. This species resembles a very dark form of Sympistis heliophila, a subarctic species with a white and black hindwing. 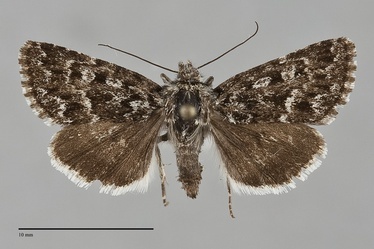 It is most likely to be confused with Sympistis nigrita in our area based on forewing pattern and size, but this species has a white and black hindwing unlike the dark hindwing of S. wilsoni. The type locality of Sympistis wilsoni Barnes and Benjamin is British Columbia, Mt. Cheam. This species is found in subalpine parkland at high elevations in the mountains, predominantly in heather and crowberry heaths. Sympistis wilsoni is restricted to the British Columbia Coast Range and the northern Cascade Mountains as for south as Okanogan County, Washington. This species also occurs in the mountains of western Alberta. Adults fly during the day and visit flowers. They are on the wing during July and August.